Dr. Targum is Scientific Director with CRF-Bracket in Boston, Massachusetts. Dr. Nemeroff is Professor of Psychiatry and Director of the Institute of Early Life Adversity Research at Dell Medical School, The University of Texas at Austin in Austin, Texas. Abstract: There is a crisis of early childhood maltreatment in the United States. In 2012, the United States Department of Health and Human Services noted 3.4 million referrals to childhood protective services, of which the majority related to child abuse or neglect. Early life stress (ELS) due to childhood abuse and/or neglect can generate life-long consequences. ELS has been associated with disrupted neurodevelopment that can yield social, emotional, and cognitive impairment; adult medical and psychiatric disorders; disability; and even earlier death. Some studies have shown that adults with major depression and ELS respond less well to conventional treatments than adults who did not experience early life stress. 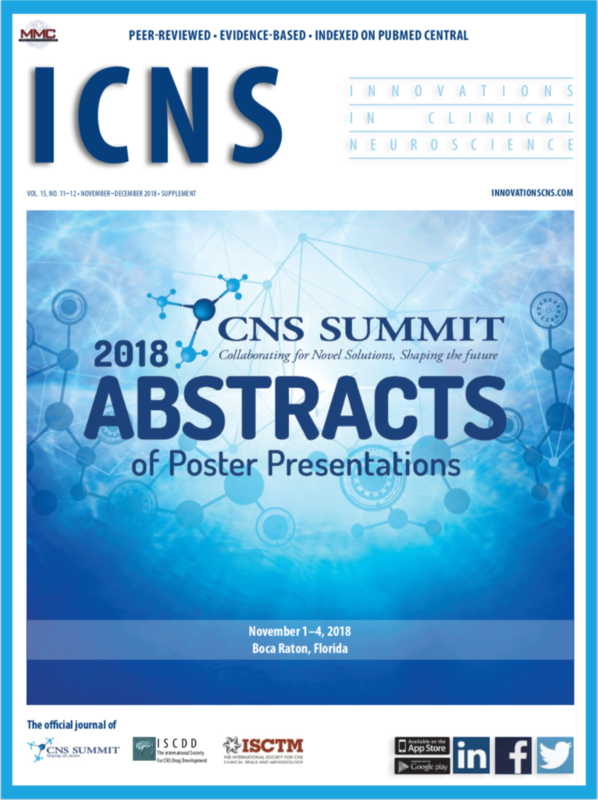 In this article, we review some of the neurobiological and epigenetic studies that explore this association. Sadly, many adults have experienced ELS. 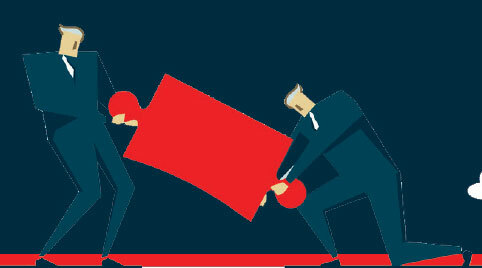 In 2012, the United States Department of Health and Human Services (HHS) noted 3.4 million referrals to child protective services, including neglect (78.3%), physical abuse (18.3%), and/or sexual abuse (9.3%). Furthermore, it is likely that the documentation of child abuse is grossly under-reported. 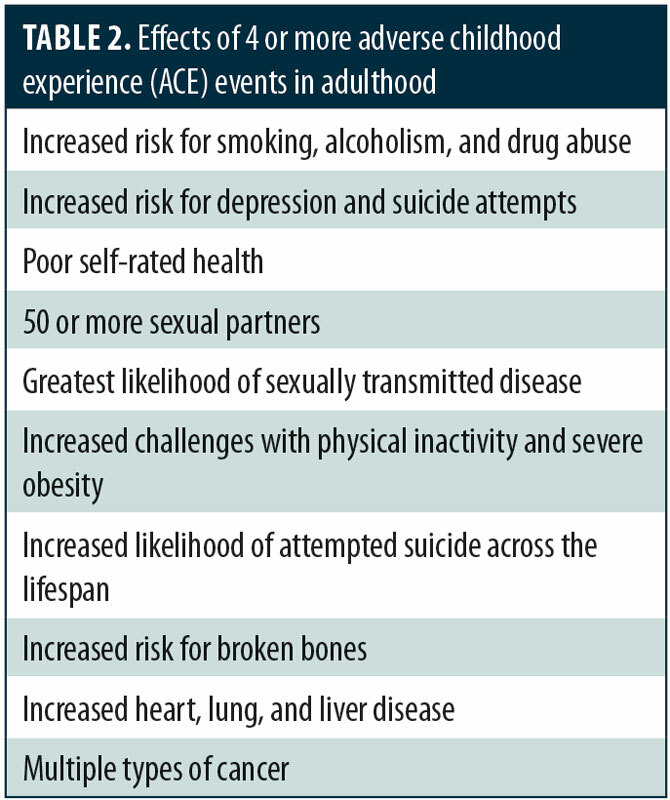 A large epidemiological study was funded by the United States Center for Disease Control and Preventino (CDC) in collaboration with Kaiser Permanente to evaluate the effects of adverse childhood experiences (ACE) in a group of over 17,000 adult members of the Kaiser health maintenance organization.1 As shown in Table 1, some of the distinct ACE events assessed included childhood abuse, domestic violence, household substance abuse, and parental loss (i.e., death, incarceration, divorce). This landmark study found that 64 percent of adult respondents reported experiencing at least one ACE event during their childhood and that those who had experienced four or more ACE events were significantly more likely to develop psychiatric or medical disorders (Table 2). 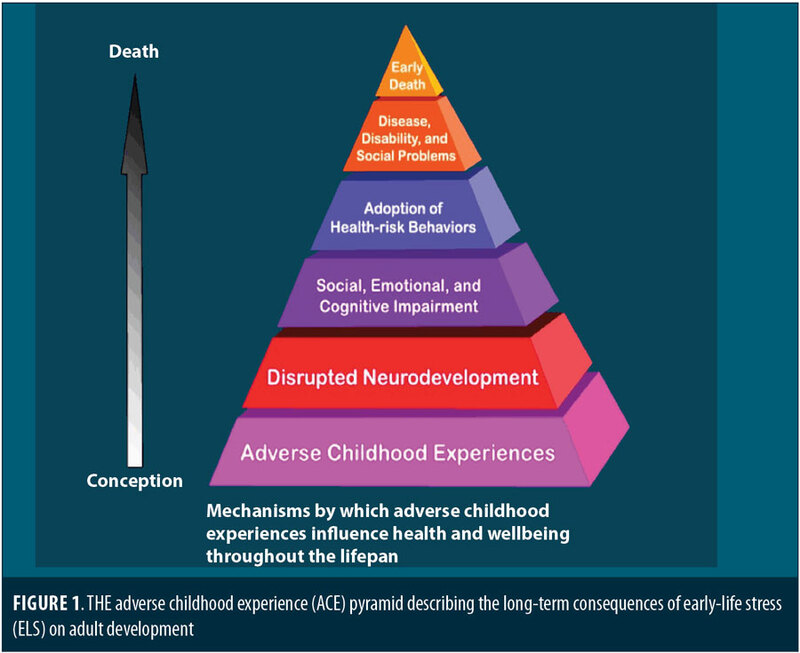 Figure 1 summarizes the apparent long-term consequences of ELS on adult development. In this article, we focus primarily on the association of ELS with psychiatric disorders, particularly major depressive disorder (MDD). Given the accumulating evidence across multiple research domains, research suggests that patients with psychiatric illness and a history of ELS are a fundamentally distinct biological endophenotype with a corresponding difference in their response to treatment. If true, clinicians should appreciate these differences in treatment planning. For this article, I asked Charles B. Nemeroff MD, PhD, to discuss his lifetime of research in ELS. Dr. Nemeroff has recently moved to the University of Texas in Austin to become Professor of Psychiatry and Director of the newly inaugurated Institute of Early Life Adversity Research at the Dell Medical School. Q: What began your interest in ELS? Dr. Nemeroff: In the mid 1980s, I was serving as an attending psychiatrist on a mood disorders unit together with my colleague Ranga Krishnan, MD, now Dean and Vice President for Health Affairs at Rush Medical Center in Chicago, Illinois. At that time, the mean length of stay for patients admitted to this unit was 30 days. We had the opportunity to taper and discontinue the medications they were currently taking and spend considerable time with them, listening to their life stories. I was struck by the high percentage of patients with mood disorders (e.g., depression, bipolar disorder) and anxiety disorders who reported past histories of traumatic events during their childhood, including physical, sexual, emotional abuse, and/or neglect. Not only was the rate of child abuse and neglect high in this population, but those with such a history appeared to respond more poorly to treatment, both psychopharmacologically and psychotherapeutically. Some years later, the CDC published its now classic adverse childhood experience study, which confirmed our clinical impressions as to the role early trauma plays in increasing risk for psychiatric syndromes, such as depression, posttraumatic stress disorder (PTSD), substance/alcohol abuse, and/or bipolar disorder, and a variety of major medical disorders, such as asthma, coronary artery disease, obesity, diabetes, and stroke.1 Indeed, the association between early childhood maltreatment and adult PTSD is now well-documented.5 But we also know that child abuse and neglect can result in a shortened life span due to the high risk for suicide, as well as the aforementioned medical and psychiatric disorders. As you can see, exposure to early life stress has broad implications for all areas of health, and a dedicated focus on ELS, like our program at the new institute, could lead to novel therapeutic strategies across the entire medical spectrum. Q: How would you explain ELS and its impact on adult development? Q: What led to your new position at the University of Texas in Austin? Dr. Nemeroff: The leadership at the university and in the Department of Psychiatry put together an opportunity for me to lead the Institute of Early Life Adversity Research, a dream for me. It will include faculty from variety of schools and other departments here at the University of Texas—people who all have an interest in this area. This includes the psychology, neurology, and neuroscience departments, as well as the schools of social work, human ecology, pharmacy, and LBJ School of Public Affairs. In addition, we have begun discussions about collaborating with a number of community leaders who are invested in addressing this crisis of early childhood maltreatment. Q: Are there useful preclinical models of ELS? Dr. Nemeroff: There are rodent (rats and mice) models of neglect that have utilized brief maternal separation, as well as nonhuman primate studies of early life stress.2 These studies, taken together, have provided many clues as to the long-term neurobiological consequences of child abuse and neglect. Q: Are there long-term neurobiological or inflammatory consequences of ELS? Q: Is there any genetic predisposition to the long-term effects of ELS? Dr. Nemeroff: Our group and others have uncovered several genetic polymorphisms of key genes involved in neurotransmitter systems that mediate the likelihood of developing major psychiatric syndromes, (e.g., MDD, PTSD) after exposure to early life trauma. In addition, there is now considerable evidence that such untoward early life experiences produce epigenetic changes that are responsible for changes in the expression of critical brain genes.8 The field of epigenetics examines the interaction between genetic predisposition and environmental exposure that shapes development and subsequent function. In one of our recent studies, we demonstrated that an increased risk for the development of PTSD is conferred by a variation in the FK506 binding protein gene (FKBP5), which is mechanistically mediated by an epigenetic process.9 The FKBP5 gene is an important regulator of the stress-hormone system. The finding of a molecular mechanism for genotype-directed environmental reactivity might lead to the development of novel therapeutic agents that target specific gene sites and to more effective treatments for stress-related disorders. Q: Have brain imaging studies been applied to the study of ELS? Q: Several studies have noted that adults with ELS are less responsive to treatment than patients who did not have ELS. Can you discuss these studies? Q: Are there any genetic connections between ELS and PTSD? Dr. Nemeroff: As I noted before, a number of studies have shown that individuals with a history of childhood maltreatment are significantly more likely to develop PTSD after exposure to trauma in adulthood.5 Our group and others have discovered several genetic polymorphisms that mediate the risk to develop PTSD in this vulnerable population, including the FKBP5, PAC1, and OPRL1 genes. PAC1 is a risk factor seen in women only and might explain, in part, the higher rate of PTSD in women compared to men. Q: What future research can we expect with ELS? Dr. Nemeroff: Research is needed to help elucidate the precise molecular mechanisms that mediate the long-term biological consequences of ELS. Successful treatment interventions that address the specific psychiatric needs of abused children and adults with child abuse/neglect history are critical. Additionally, the design and implementation of educational programs that reduce the unacceptably high rate of child abuse and neglect in our society and worldwide are necessary preventive measures. United States Centers for Disease Control and Prevention. 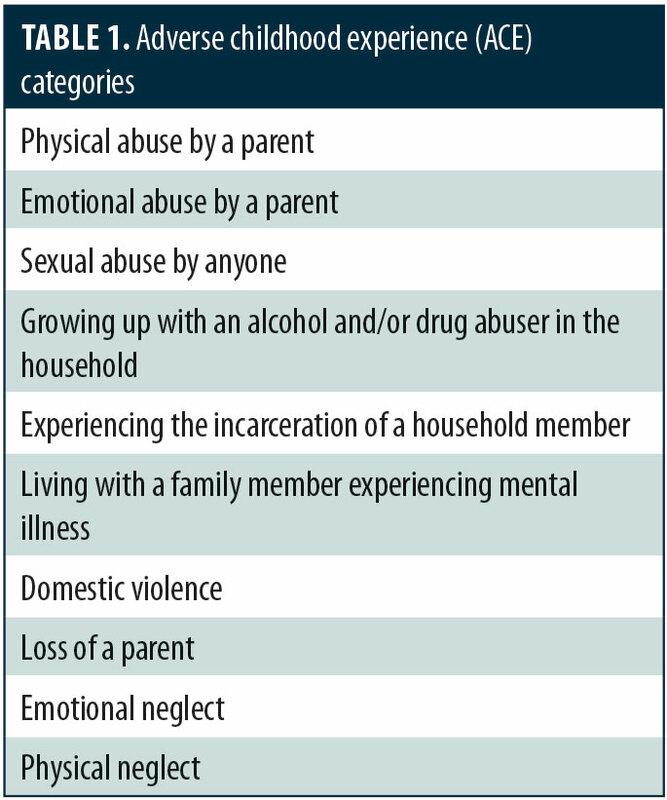 The CDC-Kaiser Permanente Adverse Childhood Experiences (ACE) Study. 14 Jun 2016. https://www.cdc.gov/violenceprevention/childabuseandneglect/acestudy/about.html. Accessed 1 Feb 2019. Nemoroff CB. Paradise lost: the neurobiological and clinical consequences of child abuse and neglect. Neuron. 2016;89:892–909. Nanni V, Uher R, Danese A. Childhood maltreatment predicts unfavorable course of illness and treatment out-come in depression: a meta-analysis. Am J Psychiatry. 2012;169:141–151. Williams LM, Debattista C, Duchemin AM, et al. Childhood trauma predicts antidepressant response in adults with major depression: data from the randomized international study to predict optimized treatment for depression. Translational Psychiatry. 2016;6:e799. Nemeroff CB, Marmar CM. Posttraumatic Stress Disorder. New York: Oxford University Press; 2018. Fagundes CP, Glaser R, Hwang BS, et al. Depressive symptoms enhance stress-induced inflammatory responses. Brain Behav Immun. 2013;31:172–176. Pace TWW, Mletzko TC, Alagbe O, et al. Increased stress-induced inflammatory responses in male patients with major depression and increased early life stress. Am J Psychiatry. 2006;163:1630–1633. Mugatroyd C, Spengler D. Epigenetics of early child development. Front Psychiatry. 2011;2(16):1–15. Klengel T, Mehta D, Anacker C, et al. Allele-specific FKBPS DNA demethylation mediates gene-childhood trauma interactions. Nature Neuroscience. 2013;16:33–41. Heim CM, Mayberg HM, Mletzko T, et al. Decreased cortical representative of genital somatosensory field after childhood sexual abuse. Am J Psychiatry. 2013;170:616–630. Goldstein-Piekarski AN, Korgaonkar MS, Green E, et al. Human amygdala engagement moderated by early life stress exposure is a biobehavioral target for predicting recovery on antidepressants. Proc Nat Acad Sci. 2016;113(42):11955–11960.